Being a nurse isn’t everyone’s cup of tea. If you want to be a nurse, you have to crack more than just the entrance exam. The interview is perhaps the scariest part of the recruitment process. Lucky for you, we’re here to help. We’re sure you’ve prepared enough for the most common questions; now’s the time to face the tough ones. So, prepare your resume, suit up as per the dress code, and rock the interview! 1. What according to you is the best thing about the nursing profession? There are a lot of rewards that come with a good job – the remunerations, the growth prospects, retirement benefits and other perks. However, remember, when you’re in an interview, the panel doesn’t really want to know how you are personally rewarded. Answer: I love helping people and care for their physical, mental and emotional well-being. I feel that as a nurse I would be an asset to your organization. The most rewarding thing about my career is definitely the cheer and optimism that I get to spread around and give my patient the hope and support he needs to overcome his ailment. 2. Would you become a doctor if given the opportunity? Most people believe that only people who couldn’t become doctors went in for nursing, that it is the next best option for medical students. Truth is, nursing is full-fledged course, an equally rewarding, lucrative choice. Answer: I applied for the registered nurse position at your hospital because I want to serve people and help them get better. Of course, I would want better opportunities in my career, but that doesn’t mean I would trade the joys of being a nurse for anything else. Being a doctor comes with its own perks, but I don’t think I am cut out for the job. I feel I would be better at assisting professionals, and managing all the background work as a nurse. 3. How has your training prepared you for the nursing job? Becoming a nurse is no child’s play. Once you have completed your medical school, you have to undergo rigorous workshops, tedious internships, and numerous professional courses. Answer: once I graduated from (insert the name of your med school), I have been a part of many projects and assisted many professionals. All of my previous job experiences have shaped up my nursing career and potential. Earlier, I just had the academic qualification but no practical experience of what my job entails. Thanks to my training, I now can handle tiring work shifts, deal with cranky patients, and cater to the needs of a nursing professional’s job in a competitive medical institution. The interviewer wants to know more about your aspirations, and career goals for the future. He also wants to see how well you have planned out your career and how serious you are about the nursing profession. Answer: Although I am perfectly happy with the way my career has shaped up presently, I do have well defined aspirations about how I want it to shape up in the future. For starters, I see myself becoming more experienced, both in clinical skills and technical expertise. 5. How aware are you of the current developments in the healthcare sector? Yes, the industry thrives on the dynamically developing technology and it is only fair that your employer wants you to be aware of it. Answer: I am aware of the many developments in the field of medicine and medical treatments. For instance, I recently read an article on the current medical innovations related to prenatal care and delivery. It was an interesting piece that dealt with the complications involved in pregnancy and how to overcome them without risking the lives of either the mother or the child. (Elaborate on the article and state other articles/news you’ve read). 6. What according to you is the toughest thing about being a nurse? Nursing is not everyone’s cup of tea. Not everyone is cut out for dealing with that level of stress and work pressure, both mentally and physically. Prove that you have what it takes to be a competent nurse. Answer: I think the toughest thing about being a nurse is to witness all the suffering around me and steel my heart to it. Of course, I am sensitive to their pain, but as a nurse, I have to maintain that professional decorum and not get attached to any patient. That becomes quite difficult sometimes. Also, dealing with the loss of a patient is always a draining experience, especially when I have to break the bad news to the family. The interviewer wants to know how much you know about the organization you’ve applied for and whether you’re truly the right person for the job or not. 8. Do you prefer to work alone or be part of a team? Now, most candidates would obviously opt for being tagged a team-player. But implying that you prefer to be part of the team all the time poses some serious doubts about your individual merit. Also excluding yourself from the team gives out the impression that you don’tgel well with people. Answer: it depends on the situation. Sometimes I am a team-player, on other occasions, I prefer to get things done myself. I am comfortable working with a diverse range of people belonging to different nationalities, cultures, and ages. I am a natural leader, good at managing people and presenting a unified front in times of emergency situations. 9. Are you a self-motivator? This is a behavioral question. A nurse should be an out and out optimist, someone who spread positivity and hope in the dull, dreary wards where patients battle with their diseases. You have to be psychologically strong and have your emotional balance sorted out before you opt for such a job. Answer: In my nursing management career, there are been but a few rare cases that have left me emotionally and mentally disturbed and scarred. Of course, I empathize with the pain of my patients and am sensitive to their needs, but I also understand my responsibilities as a professional. I constantly motivate myself and those around me to give in the best shot and put in 100% effort in whatever we do. 10. How would you deal with conflict in the workspace? Conflict in the workspace is a common occurrence, how you react to it is your prerogative. Answer: In my earlier workspace, there was a time when there was a conflict between the doctors and the Director of Nursing that created quite a ruckus in the hospital. And while I wasn’t actively involved in the incident, I did try to understand the crux of the problem and try to find some resolution to the conflict. 11. How would you handle the distressed family members of a patient? Another situational question, that you must answer citing real-life examples. 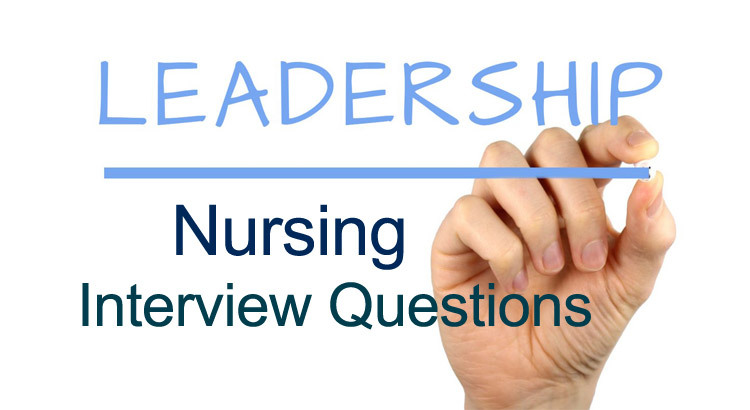 Answer: The toughest thing about being a nurse is to deal with the people involved with the patient. You have to be firm yet gentle with them in breaking down the bad news. I understand my duties as a nurse, I have to inform the family of the progress (or lack of) of their loved ones, keep them updated on their medical condition and also take care of the medical formalities involved in such cases. 12. How would you deal with a patient who is not happy with the services of the hospital? Patients are often cranky, but then again, you are witnessing them at their most vulnerable, lowest state. Only some patience, resilience, a sense of humor and a thick skin can heal such a person. Answer: Dealing with an aggressive, depressed patient is a difficult task but not an impossible one. I will try my best to keep my cool and understand the crux of the issue. In case the problem is serious, I wouldn’t hesitate in calling for a professional psychiatrist. 13. How well do you handle stress? The nursing profession involves a lot of work pressure and is perhaps the most stressful job in the world! The panel here wants to see how well do you fare under stressful situations and how productive you are for the organization. Mention incidents and anecdotes from your previous work experiences focusing on how you dealt with an emergency case highlighting virtues such as immense patience, honesty, transparency, and sensitivity. Of course, you do! This is the time when you can clear all doubts regarding the shifts, the salary expectations and other details related to the job. Always have some questions ready, it gives out the impression that you are actually interested in the position.